Mucus-Clear™ is the ultimate natural solution for throat congestion. This effective mucus remedy temporarily relieves sinus phlegm and reduces throat clearing cause by thick mucus. It is safe and effective, non-addictive and contains 100% homeopathic ingredients selected to relieve symptoms of throat congestion. Formulated by our team of experts in natural medicine, Mucus-Clear™ aids in natural decongestion and helps rid the body of excessive, thick phlegm. A powerful homeopathic formulation for the discomfort associated with excessive throat mucus, Mucus-Clear™ uses a unique, proprietary blend of highly diluted natural substances to help clear mucus from the throat and lungs. Kali bichromium (Kali bich) has a long history of providing successful relief for large amounts of jelly-like mucus secretions, profuse nasal watery discharge, and violent sneezing. However, our team of herbalists, naturopaths, homeopaths and responsible pharmacists know that one ingredient does not provide a full solution. Therefore, we have created a unique blend of three scientifically selected ingredients that enable Mucus-Clear™ to provide a natural, effective and safe choice for natural decongestion and respiratory health. 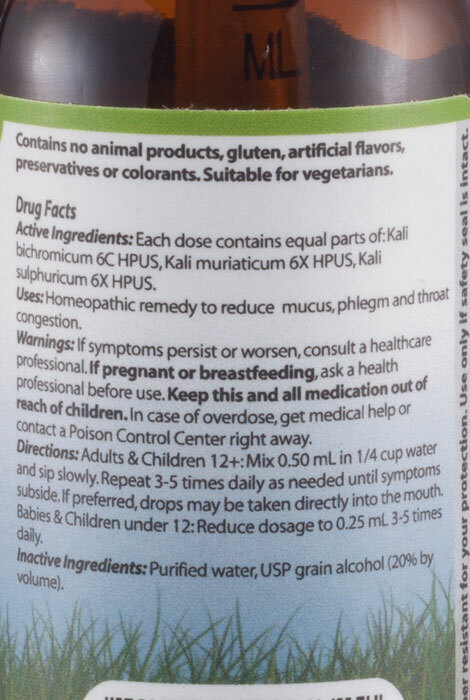 Mucus-Clear™ is 100% homeopathic and contains these ingredients: Kali bich 6C HPUS, Kali mur 6X HPUS, Kali sulph 6X HPUS. Mix drops in 1/4 cup of water and sip slowly, or drop directly into the mouth. Adults & Children 12+: Take 0.50 mL 3-5 times daily. Children Under 12: Take 0.25 mL 3-5 times daily. 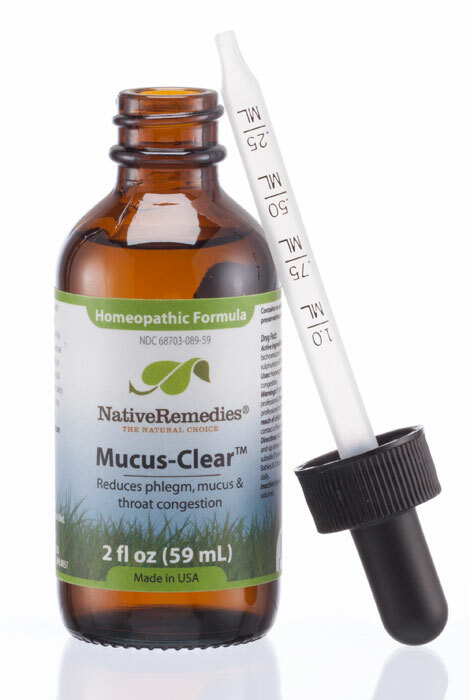 Mucus-Clear™ is a homeopathic remedy and is safe for all ages. There are no known drug interactions. A homeopathic remedy can be taken 10 minutes after a meal, or 30 minutes after brushing the teeth (since many toothpastes have strong flavors such as mint). One 2 fl oz bottle of Mucus-Clear will last approximately 24 days. Exactly how long a bottle lasts will depend on the frequency of use. Often, as in the case of all good tonics, a gradual improvement is felt over time. Best results are achieved when Mucus-Clear is used consistently along with a healthy lifestyle. I’ve used it before, and was very satisfied with the product. To help get rid of my persistent congestion. This is the only product that has ever worked for me! i have a lot of mucus settling in my throat. i am a singer and it affects my voice. i thought i would give murcus clear a try. I'm a singer with allergies. This helps with the post nasal drip. My daughter has allergies which causes her to clear her throat quite often. This product helps her so much by ridding the mucous and the need to constantly clear her throat. I feel like I have mucous in my throat, especially in the morning. This is also very annoying whenever I'm at the dentist as I keep feeling like I need to swallow. I know that some of that "feeling" at the dentist is from being nervous but none-the-less it's quite annoying and sure hope this cuts the mucous and the feelings associated with it! I hope it will help me control mucus. Have used this product before. worked well. However, the new bottles do not seem to be as effective as the past. Maybe a formula change--the taste is slightly different. Go back to the original formula/strength. I am constantly clearing my throat. It is frustration. Will this help? We'll see! Seeking remedy to lessen constant clearing of throat caused by mucus draining. I PREFER A HOMEOPATHIC REMEDY TO MY THROAT PROBLEM. Had a cold in September. Still dealing with cough caused by mucus. Also hoping it will work. It's expensive, but I have this chronic "something in my throat" thing that makes me feel like I need to cough something up, but nothing comes up. :-( If this works, it will be worth the price. Because they are good. I have written this comment in the past already. Wanted to try for my Brother , as a prevention for recurring nasal issues. My husband has a problem with his sinuses and is constantly clearing his throat. How long does it take for the native remedies mucus clear to help clear the mucus? BEST ANSWER: Thank you for your question. People can differ widely in their response times to natural remedies depending on individual makeup, lifestyle and diet. Some may experience a general feeling of wellness within days, while for others it may take longer before an effect is felt. We hope this information will be of help to you. For me it took effect fairly immediately ... but it doesn't totally fix the problem. It does help, though, enough that I am continuing my use of it. Is there grain alcohol in the Mucus-Clear product? BEST ANSWER: Thank you for your question. 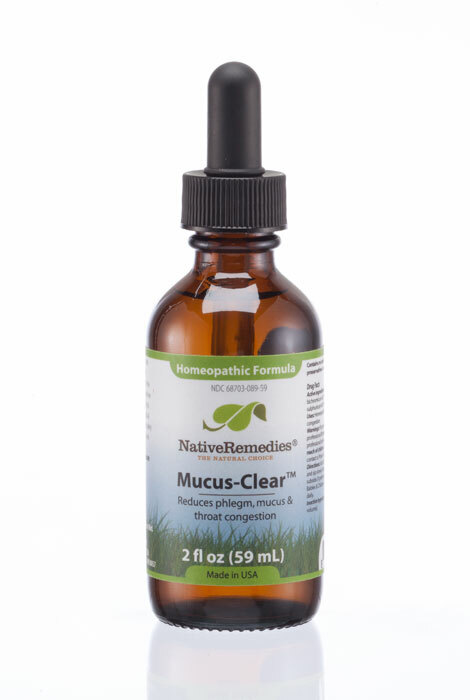 Mucus-Clear is 100% homeopathic and contains these ingredients: Kali bich 6C HPUS, Kali mur 6X HPUS, Kali sulph 6X HPUS. We hope this information will be of help to you.